Singapore is quite practical in the setting up of accompany there and looks favourably on foreign investment. The first aspect when should consider when relocating or registering a company in Singapore is that companies here as usually registered as private with limited liability. A company is thus legally separate with the shareholders not liable for any company debts which exceed the share capital which they have put into the said company. According to Singaporean law any person who is over 18 can register a company in the country and this applies to both local and foreign persons. This form of private limited liability company is usually good for tax purposes so it would be your best option if you are setting up in Singapore. The first obvious fact is the company name and which has to be approved before registering the company. Singaporean law allows one resident director of the company as a minimum. However there is no minimum on the number of directors which are not foreign or local to be appointed to the company providing they are over the age of 18 and do not have criminal records or financial misappropriation. Additionally one does not have to be a shareholder of a company to be appointed director. The company can have between one and fifty shareholders as a minimum and maximum respectively and as already stated, the directors need not be shareholders. Actually the company’s shareholding may be in the form of another company or a trust with the provenance of the holdings being local or foreign. Share transfers may be conducted freely after the company is set up. Each company must also appoint a company secretary who is fully qualified and this has to be done within a six month period after the company is set up. If a company has just one shareholder or director then this person cannot be the company secretary. The law also requires that such a company secretary be a person who is a Singapore resident. A company can be registered in Singapore with just USD 1 as the paid up capital or share capital. This may also be increased and there is no authorised capital for companies in Singapore. A registered address must also be provided and it is important that this cannot be a post office box. 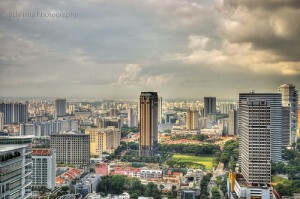 The tax rates in Singapore are also quite advantageous. You pay only 9 per cent of tax on the first USD 300,000 profit made in a year which rises to 17 per cent thereafter. Additionally Singapore does not levy corporation tax or capital gains tax. These tax rates are amongst some of the reasons why people choose Singapore to set up their company coupled with the reputation as a centre for business and financial excellence which it enjoys. If you are a foreign person who wants to set up a company in Singapore, there are a number of issues which you need to know. First of all, you cannot simply register a company but this has to be done through a professional company since the law does not let individuals do so. If you are registering a private limited company and do not wish to relocate to Singapore then you do not need any visa. You can operate the company from another country and you may also come to Singapore through a visiting visa if you need to attend board meetings or other company business. However it is important to note that you need at least one local director who is a nominal resident in Singapore to conduct business. Advisory firms will usually recommend some sort of local person to act as the nominee for the company so you are easily covered in that sector. The situation is different if you want to relocate to the country to live and work there. You have to acquire an Employment Pass or an Entrepreneur work pass which is not that much of a problem. As soon as you get your work permit you can then be your company’s local representative. The whole procedure to register a company can be made while you are out of the country facilitating setup considerably. However if you wish to open a bank account, some banks require you to be physically present to do so. The name of the company, description of business, the personal details of shareholders and directors, the company’s registered address and the personal details of the company secretary. You are also required to produce a Memorandum and Articles of Association. This is usually provided in standard forward by the Company Registrar in Singapore. The other papers and documents which are required will usually be collected by the firm which you will engage to set up the company. If you are a foreigner, you will need a copy of your passport, proof of residence as well as other documentation such as bank references, a profile of your business activities and also other references from persons of good standing. Copies of registration documents are also required if the shareholder is a corporate company. These will include the MAM and the actual Company Incorporation Certificate. The registration of a company in Singapore is an automated process and is a very efficient method with as little bureaucracy as possible – a distinct advantage if you want to set up a company there. In fact, the company which you register may actually start operating within a couple of days. The two main steps for a company to be incorporated is the approval of the company name followed by the registration of a company. These two procedures may be actually made on the same day if no delays or problems crop up which may halt the Company Registrar in issuing the documentation.